Fence - used to protect or surround our house with a wood or something like a wall from outsiders or animals to pass into. 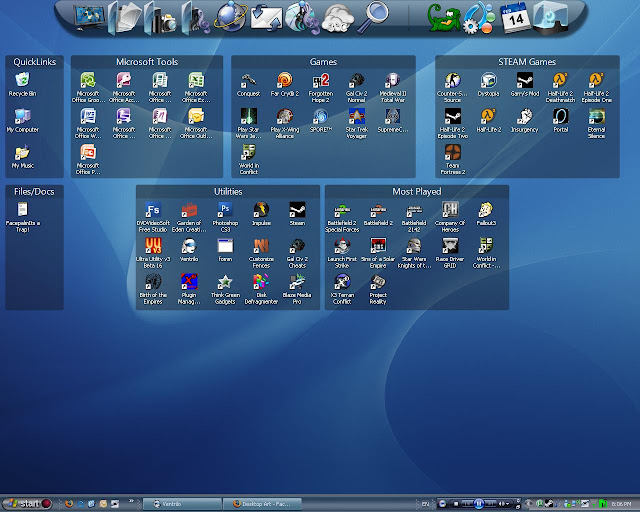 Similar to that, we can separate or make a boundary across desktop icons we choose. To make it simple, you can categorize icons on desktop. You can drag and drop desktop icons on them. Fences is simple and innovative PC tool which can make your desktop workspace more accessible and enhanced. We customize all files and documents by copying them to folders. In the same way, Fences gives users to organize desktop icons which includes shortcuts, files, folders, etc. Fences can be customized manually of your choice or automatically depending upon some criteria. You can even resize the fence, change its color, hide them, etc. Double-click to hide/show desktop icons. Change color and opacity of fences. Store fences on different locations for different monitor configurations. Integrates or fits with any Operating System (Windows Xp, Windows 7 and Windows Vista). The above features are available only for free version. If you upgrade to premium version, you can get more options to access for just $19.95. Fences stands #1 in Desktop Customization Tools. Get more information about features and downloading this Fences software for free from below link.